Easily import email into TntConnect history from any IMAP (email) server, including Gmail. Works with TntConnect 3.1+ databases on both Windows and Mac OS X.
MIST 2.0 was just released and shouldn't have the problem you mentioned, Peter. If it does, please let me know. Any chance of building this into TNTMPD so that it would work on Mac as well? Johnny: MIST 3.1 was just released today. It includes support for Mac OS X. I'd love to hear your feedback! Thanks for noting that, Stephen! I've had others report something similar, but I haven't been able to track down the "why" yet. In particular, for some people, 499 of those emails work just fine but one of them has some kind of problem that makes MIST unhappy (and so it never gets to the other ones). I haven't quite figured out what causes it yet. If you're interested in doing some debugging for me and can narrow it down to one message in particular, that'd help a lot! You could go about that by taking out about half the emails and seeing if the problem persists. If so, take out another half, etc., until the problem goes away. That narrows down the set of emails until you're left with one (or a few?) emails can trigger the problem. We can then try to figure out what about them specifically results in the hang. "WIndows cannot find 'javaw'. Make sure you typed the name correctly, and then try again. Sorry you're having trouble! Since you also wrote up the issue on the MIST website, I'll respond to the problem there. Is the MIST program giving problems connecting to IMAP servers? I'm have no success setting it up with my personal email server account and with a Gmail account. If you have 2-step authentication turned on for your Gmail account you will need to generate a specific App Password for MIST. Go to myaccount.google.com/apppasswords and under Select App, choose Other. Type in MIST. Google will generate a specific password for you to use in the MIST Preference screen to login. I just set up MIST 4.0 with my TNTConnect 3.4 r3. I've successfully set it up to connect to my gmail via IMAP. 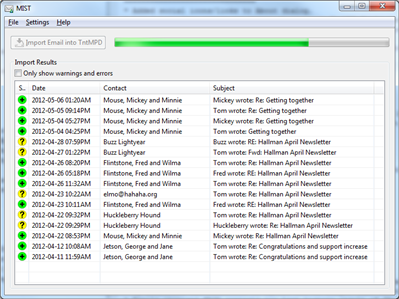 While I'm able to import email I've dragged into the TNT label I created in gmail, MIST will not recognize the replies I've sent to these contacts in the Sent Mail folder, even though it appears that the entire conversation is labelled as TNT. Does anyone know what I might be doing wrong? Is MIST still actively supported ? Thanks so much. Please disregard my prior question...found the answer on the SourceForge page for MIST. Feel free to delete these two comments if you'd like. Thanks! I'm occasionally getting a problem upon opening MIST 4.0. It will not let me reconnect to the database. I found an old thread on the support site (for an older version of MIST) that said to try the Compact and Repair DB option in TNTConnect. That solved it (for now), but I'm wondering if MIST 4.0 is fully compatible with the most recent database changes in TNTConnect (current version 3.4 r3) ? Thanks for any help. Yes, still compatible and fully functioning.